I really want to start Hannah Pepper. Siobhan, you called me on it - when I said I didn't want to start anything big right now. I just can't help myself!! :) The only problem with Hannah is I don't have the called for silks (AVAS). I do have the DMC. I think they're very pretty. I also did a conversion to Needlepoint Inc. (my favorite silks). I switched out the lighter green for a darker green, so it looks more like the picture. I'm still thinking about it, but I think I may go with the NPI. What do you all think?? Here are the colors I'm using (I'm still not sure about a couple). 2236 - 313 or 903? 2914 - 571 or 532? Go for it, the colors are great!! Hey, you of the blazing needle! Great job on all those finishes... I'm still stitching along on A Wish... So, don't you prefer silks? Aren't the colors 'just about' perfect? Then I say, so with silk! Enjoy some sunshine today! My choice would be the silks--every time! 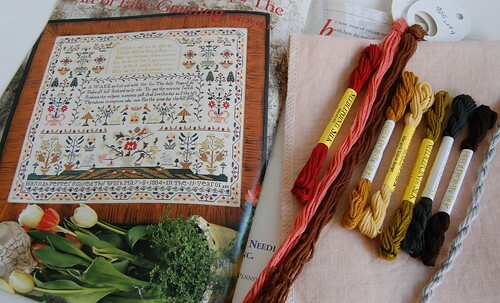 This sampler is gorgeous. I have the pattern also and would love to stitch it. I would use the requested silks. This is a very large heirloom project that you will working on for awhile. Make sure you love the linen also. If you have the NPI go for it! Looks like you do and your conversion is fantabulous! I love the NPI conversion! Go for it! Can't wait to watch your progress! I think you should go with what pleases your eyes the most! They both look like great sets of floss. The silk may be easier to work with for the design though! Have fun and lookin' forward to watching you work through this one! Silks have a much richer color, so if I were doing a large heirloom piece that is what I would use. By the way, where did you get the pattern? I would love to obtain a copyh of it. I think for a piece like that I'd go with the silks The conversion you did looks fantastic. Also, congrats on your finishes. They all look fantastic. I like the NPI best. They look more like the picture, I think. So where do you get your NPI's, online, stores?/? I've been wanting to try them. I prefer NPI silks one hundred times over any other silks. Besides, when you use silk you only have to fuss with one strand! 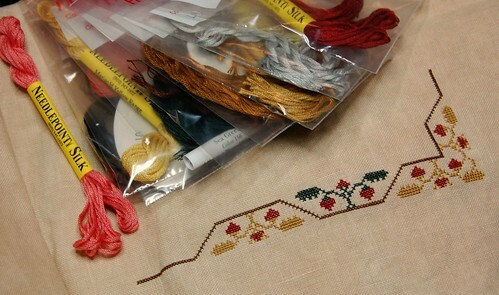 I am currently working on a piece using Belle Soie. I have never used this silk before and I have to be honest....I don't care for it. NPI is my favorite! Can't wait to see your progress! i love NPI but i have also fallen in love with Hand Dyed Fibers by Vicki Clayton. great price and oh they stitch up beautiful. she even puts them on a little spool, which i love. i agree silk is a must for such a fantastic piece. Lovely start with NPI! I just came back from LNS with some NPIs :) I was too tired to get started a new one - Sarah Rambo's sampler, but after seeing your post, I may have to stay up till later to play a little bit! Enjoy your new project. Love the NPI conversion, Hannah is such a gorgeous piece. NPIs are my drug... er, thread... of choice. I LOVE your start!! It's such a fun sampler--just make sure you check the corrections over and over again! ;) Learn from my mistakes, LOL. I'm sure you'll have this one done in no time! 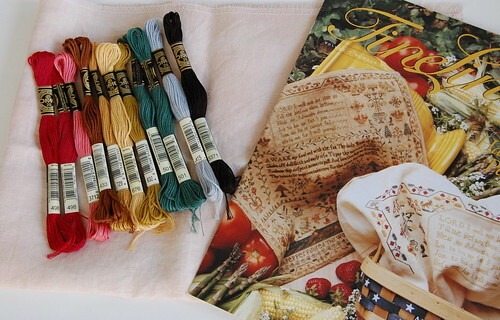 Where did you buy the Historic Needlework Guild, with issue? You are making great progress on this....good for you. As much as I love looking at silks, my fingers don't like them, soni usually stick to DMC. I can't wait to see more progress on this! I think it looks beautiful Nicole! Haven't tried the NPI threads yet. Your conversion is wonderful as always. The colors look great and you have a great start. I would have chosen the silks too! Your start is beautiful. I sure wish Fine Lines was still around. Someday I'd like to stitch this one too - of course finding the pattern may be a nightmare! So pretty - how could you resist? Nicole: I've had HP in my stash for sometime but discovered that there is ahuge mistake in the chart. Have you discovered it? If you have and have any ideas on what to do, please let me know. I really want to HP. You can reach me at canderson492000@yahoo.com. Sarah and Some Market Stash! A Wish For You Finished! Shores of Hawk Run Hollow Finished!! Shores Block Five and a Surprise!